I am not a fan of seafood, but I do like to taste it once in a while and while I am more a gravy and noodle person rather then a noodle, gravy and seafood, the people who eat with me tends to gain from this whole little foodie escapade. Today I felt like having Sang Har Mein. I just felt like eating it with just the gravy alone. Another reason I don’t mind Sang Har Mein is because it is fresh water prawns. Somehow there is always mixed reactions of the taste of fresh water and seawater prawns. I for some reason prefer fresh water fish and prawns because to me it does not taste so fishy and does not smell. Then you get other gourmands arguing that it tastes like mud. And my question is, how do you know the taste of mud? Trust me I am a little warped when it comes to seafood, so do not take my word for it. I used Seafood Tofu in mine because then I get to enjoy some form of protein. I’ve added some vegetables to it as well, you could use young endives or Brussels Sprouts. So here is my easy peasy version. I do sometimes add in a bit of Nam Yee into it. Nam Yee is stinky tofu, which I think is as versatile as sambal belacan. A tiny bit though, because a little bit can go a long way with this ingredient. Heat oil in a deep saucepan, sauté garlic and ginger. Add in oyster sauce and give it a stir before adding hot stock. Leave stock to simmer and add in sesame oil, wine, and black vinegar. In the mean time heat a pan of oil for deep frying. Open up the egg noodles and with a wooden pair of chopsticks, swirl the noodles in the hot oil till it puffs. Strain and arrange on platter. Add in sliced seafood tofu. Once it is boiled, thicken with cornstarch mixture. Add in prawns and cook on high heat, season to taste. Drop beaten yolk from a height so it will have a dropped egg look. 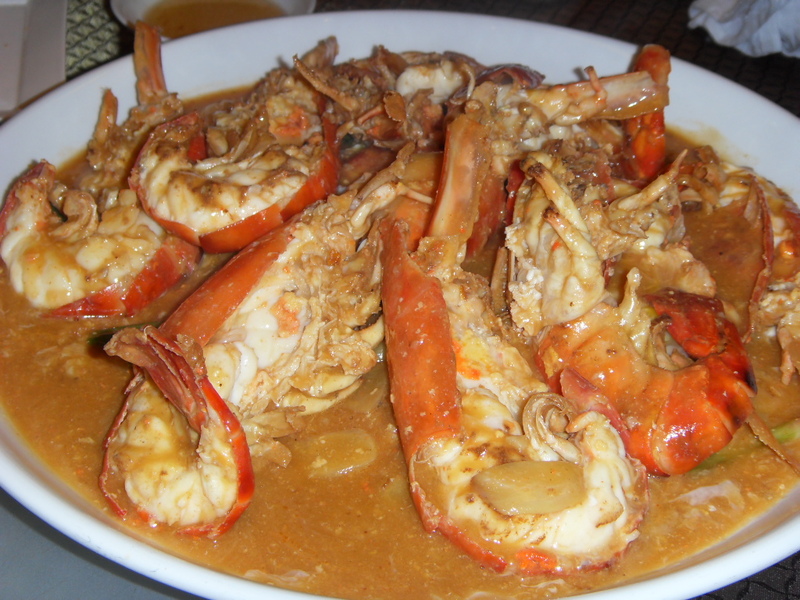 Gravy may become red if prawns has roe in it. Add in spring onions, and pour gravy and prawns over noodles. I’m just shameless, I told myself NO MORE Buka Puasa Stall food… NO MORE!!!! And then guess what?? I was there at 3 pm sharp walking around amidst some of them setting up and some of them preparing and all, clicking away and buying more food. You know while all the Muslims in the world will be losing weight, I’m going to be gaining. Well today for some reason, this ladies stall attracted me. Thing is she is right in there in full sight from my kitchen but I never saw her till today. How strange, and seeing that the Satay man has been missing since day 2, I thought she was the replacement, but then I remembered that the Satay Man was not there he was a little bit further. I thought it was rather strange because I would have seen her since I am well known for seeing things others don’t, good bad, or evil and somehow I never saw this stall till today, and I noticed she had Kerabu, which is a Malay style salad. I was salivating looking at it, I don’t know why. Men do have cravings you know. Well I do anyhow. So I thought I had to check this lady out and off I marched out of my house and I was only going to get Kerabu. Well I got there and she had all sorts of I must say authentic Malay food, and so I ordered Kerabu, then I chanced upon Cow Lungs (I know it sounds wrong, but it cannot be Beef Lungs), and it was not coated in chilly just a wave through the wok with a little oil and chilly, you know the chilly that can stick in your teeth and make you look silly. That kind. She had all sorts of stuff, I just could not take a proper photo because people were still unpacking and cars were moving around. I would have loved to have taken more photos. She had Cat Fish, she had tempeh sambal, she had those snail like things in the photo. So now I had two items, then Aunty Mary wanted Pulut Panggang, so off I marched there to get some. The man and I seem to be good friends now for some odd reason. 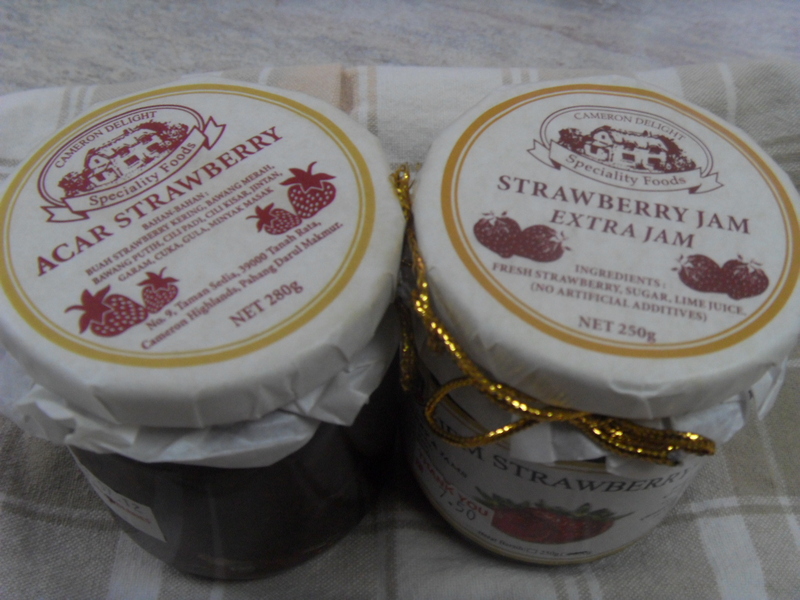 Then I was suppose to get some Mee Jawa for Aunty Mary and then I chanced upon this man selling jams, so I had to look see and I ended up buying a bottle of Strawberry Jam and Strawberry Pickle. Now I thought I’d help out the man because I was sure no one would go and buy his stuff because unlike the others you had to get close to his stall to see his products and Malaysians have a tendency not to go near and look for fear they will have to buy or lose face! And it was very very nice. 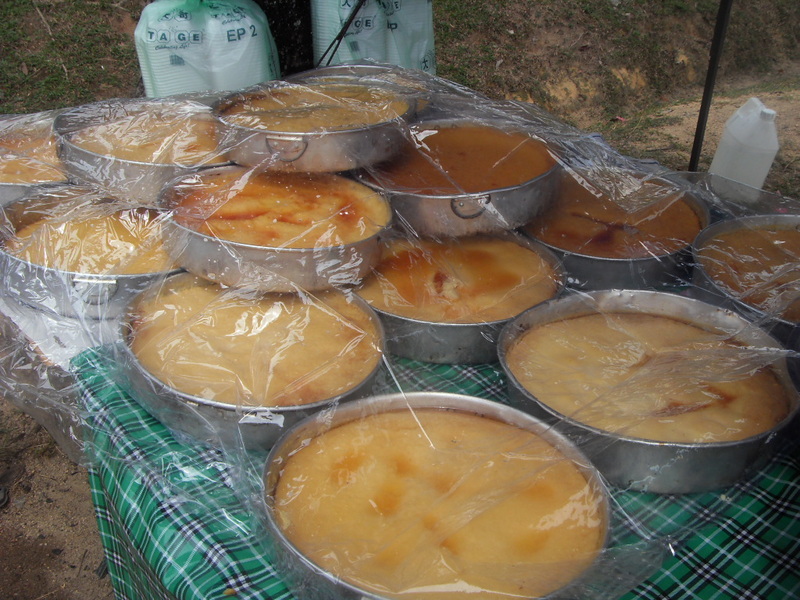 Its made in Cameron Highlands. I just saw dad eating it with a spoon just now. The Strawberry Pickle was oh my gosh, I wish I brought the bottle back to my house now. I hope people watching me buy it did go and check it out, because I did see people watching me when I went to his stall. Good Stuff… do try it. 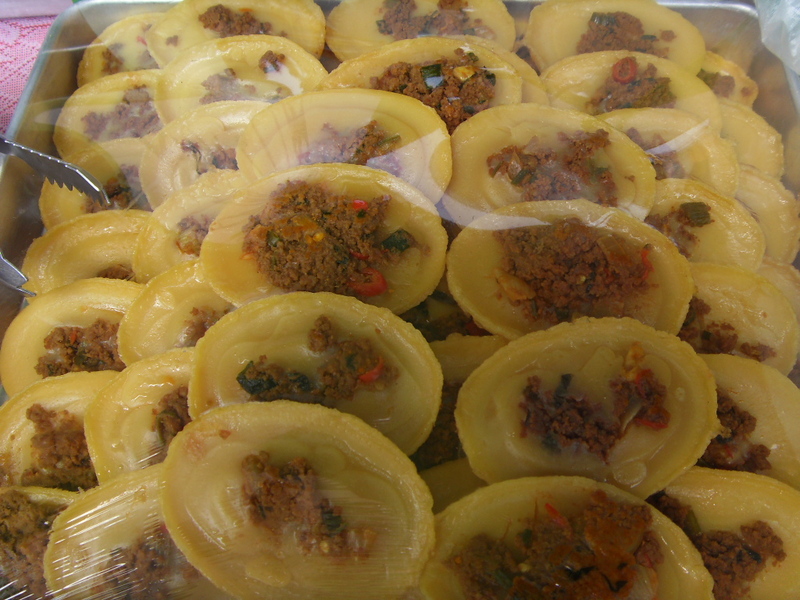 Then I said enough, and Diva Kuih saw me and smiled so I bought her meat curry puffs which are rather nice actually. 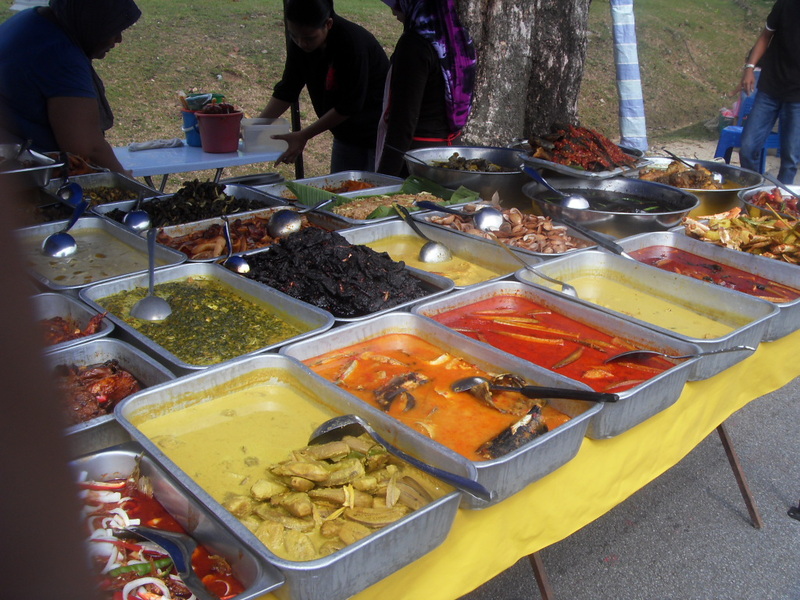 Then I walked back and passed the Nasi Dagang Stall. Now I heard someone say very loudly that it was really nice yesterday, so I thought ok let’s have an early dinner at 4 pm. Oh my gosh… it was like entering an eatery at Pantai Cinta Berahi or I think it is called Pantai Cahaya Bulan now. I was given the pack of rice and had to choose my accompanying dishes. They had fried quail, I have ever eaten fried quail in my life, I don’t know why. 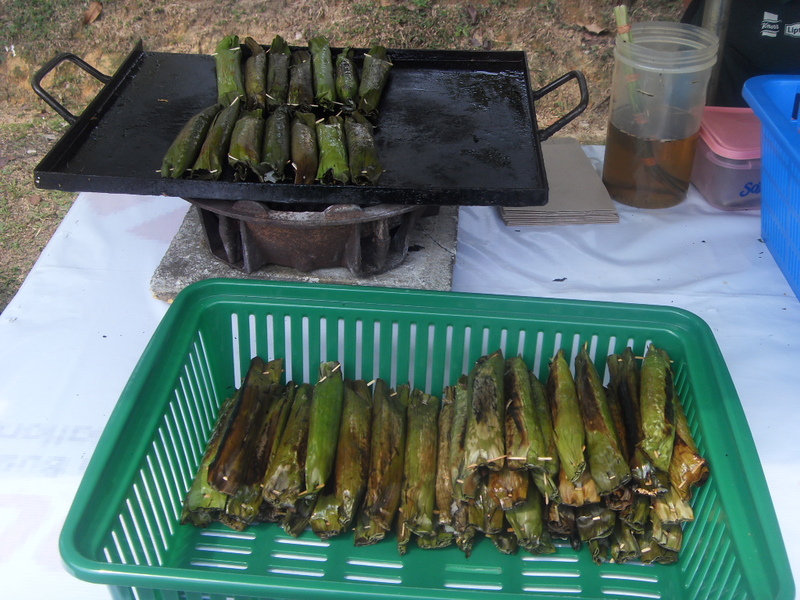 but I just never did, and it was freshly fried, ohhh I was so excited, and I looked around and saw Solok!! I have not had Solok since i was in Kelantan with Chia Chen, Hafiq and Poh Leng, and that was in 2009. 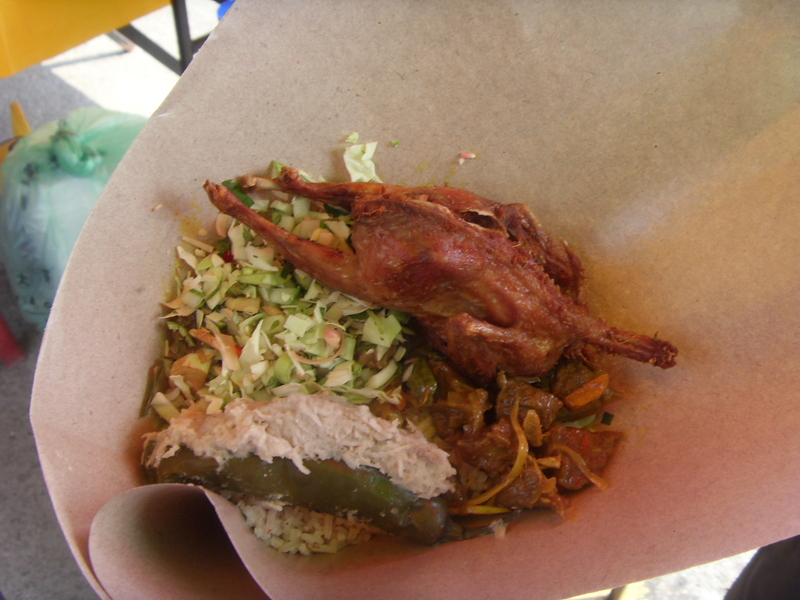 So in the end I had a quail, solok, beef curry, and fresh vegetables for health reasons. Now everything in that packet tasted delicious. So the meat was a little tough, but I liked it. Meat should have bite, and if you like your meats too soft, you’re just not giving your teeth a chance to be used. I shared it with Dad and Aunty Mary, and everyone enjoyed it. Nothing was left behind. This looks like it is necessary to repeat. The quail was perfection. It did look like a tiny bird, and went tinier after it was fried, but the taste was really nice. I did not take enough photos, so maybe tomorrow. If anyone is wondering what is Solok, it is fish meat usually mackeral mixed with coconut, and flavored with usually some lemon grass and stuffed into a chilly. I did a class on Solok two years ago, it was fun but a lot of work. So I got home and we had dinner at 4 pm, and now at 9.54 pm I am hungry as hell. I need more Nasi Dagang. Just as Orphan Annie sang.. The Sun’ll come out… tomorrow, bet your bottom dollar that tomorrow… will be fine…..and you can bet I’ll be there doing my taste tests for the good of mankind. Today I was with Emi my friend and PA and she was quite excited about the Buka Puasa Stalls just outside my house and you could see her face peering through my kitchen window to see if they had started. Well I was there too peering to see the same thing. So at 3 pm, we went on our walkabouts with mum tagging along to buy Wajid and Pulut Panggang to take to Singapore tomorrow. Well in the end we came back with ten different foods, and we could have still bought more. Funny though, we were the only ones at the whole bazaar that were carrying Tupperware. 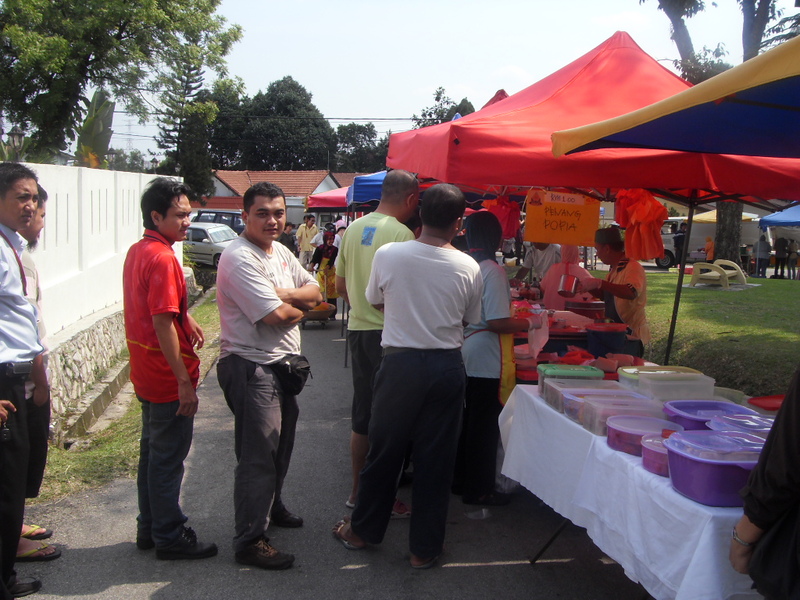 So here are more highlights of My Ramadhan Buka Puasa Stalls – well because it is by the side of my house so it is mine at the moment. 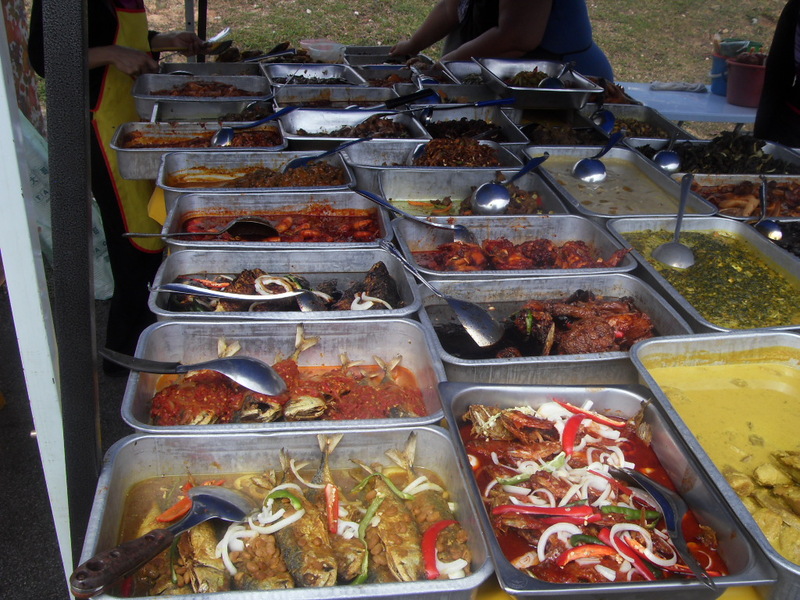 Now Nasi Beringin comes from Johore and it is similar to Nasi Lemak except it has got Ghee or clarified butter added to give it its distinctness. Now as if we need more richness in the rice, but it sounded rather delicious. I am so tempted to try it but as usual, I dare not because I’ll get all worried and flustered after I eat it. This Nasi Beringin comes with a whole lot of accompaniments much like Nasi Lemak but Kak Azuwa’s stall seems to be that bit more decadent. Take a look at the photos. Then I finally took a photo of Kokopelli’s Stall, the famous fried Koay Teow cooked by a Artsy Fartsy Malay Man in true Chinese Style! Pity I could not take a photo of the chef as it was early and they were setting up, but I will do so tomorrow from my fence! So far we have devoured 6 packets of his a la minute Char Koay Teow! It comes in a cutesy little takeaway pack as well. Next was the Penang Popia, the one I talked about yesterday, today I finally managed to get a photo as it was still early. This is the one with the goss! The line was already starting as you can see. And this line goes right through my backlane that it is even exhausting for me to watch these people line up in the hot sun and thunder and lightning for these Little Wrapped Wonders. And today I was lucky I actually got a frontal shot of them making the Popiah Basah or Fresh Spring Rolls. 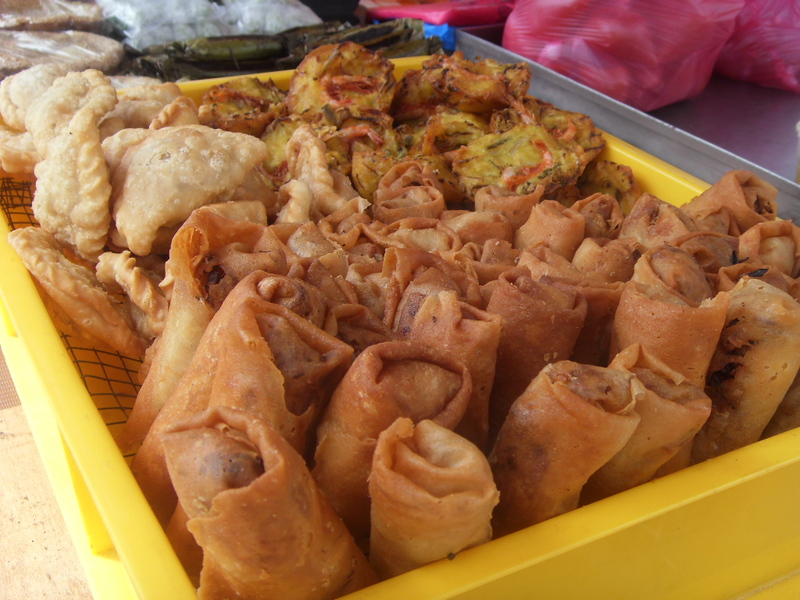 These Spring Rolls originate from Penang. While it was a Baba Nonya staple, but the Indian Muslims over there improvised and made a spicier version which is not a staple for Breaking Fast. Next was a stall that sold different types of Porridges, Congee and Gruel so to speak. 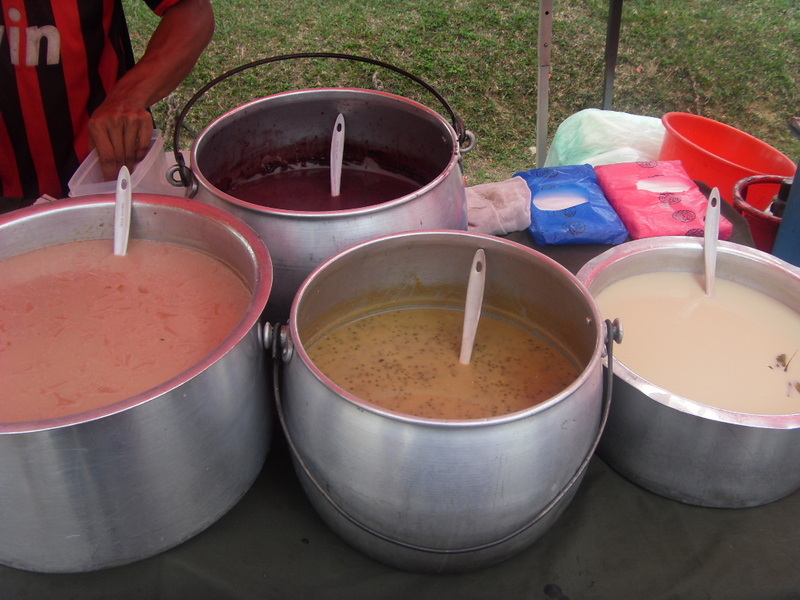 The famous is of course Bubur Lambuk. 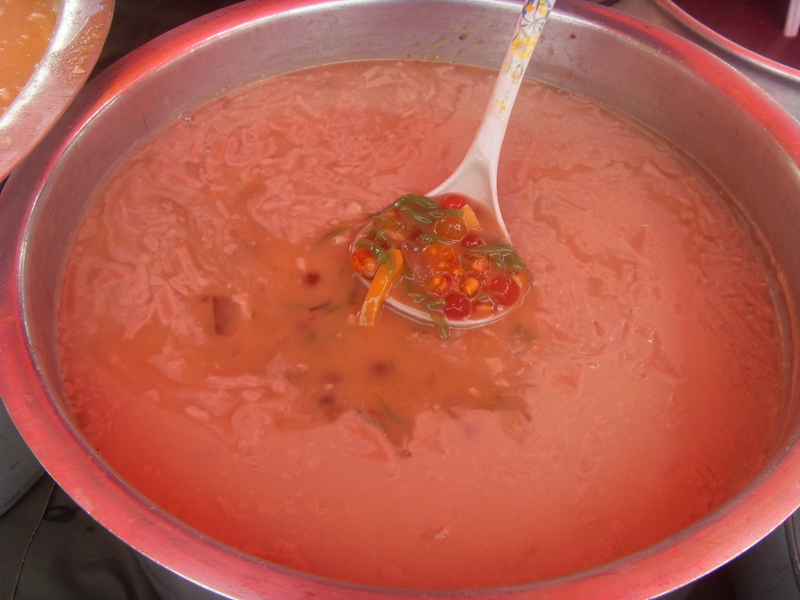 While Porridge is mostly Chinese, Bubur Lambuk is a staple for the Malays and it seems like it has any kind of meat in it. I ate it for the first time today and I had bits of minced beef, squid and I even saw a prawn. The rice is boiled in a big cauldron and all these meats and flavoring are added to it and boiled it is is a pulp. Coconut milk is added although I did not taste any today but according to mum there was some traces. Still it was quite tasty and I would have preferred it without the coconut milk due to health reasons. Pots and Pots of Cholestrol - Delicious though.. worth the attack and the clogging! 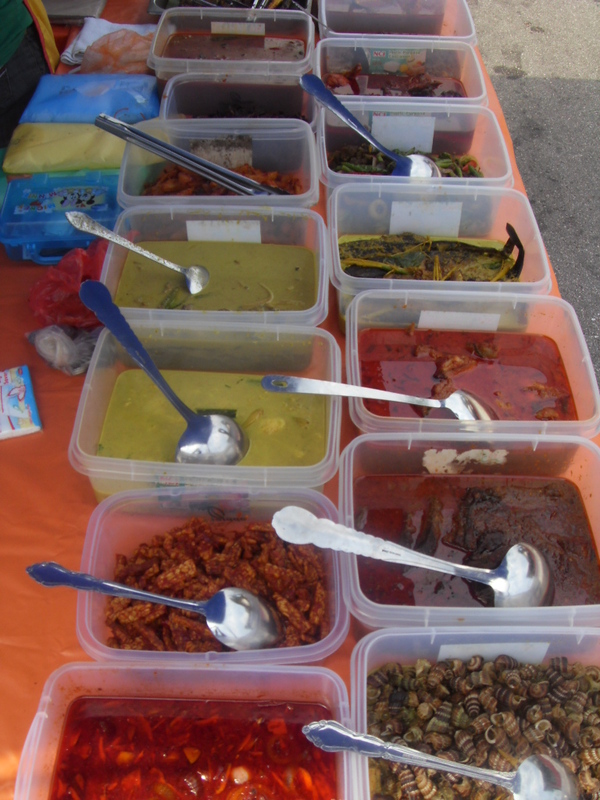 The other delights was the various sweets they had like sweet potato in coconut cream, mung beans, red beans, pengat pisang and one that had all the ingredients of Ice Kacang except that it was hot. I had that too as well. Poor Emi.. had to watch us eat. Now today was a bit different, funnily I read about this stall in the Star this afternoon, and then I chanced upon it during our walkabout this afternoon with Emi and Mum. I thought it looked so like we were at a European Fair or Fete. Check this out. 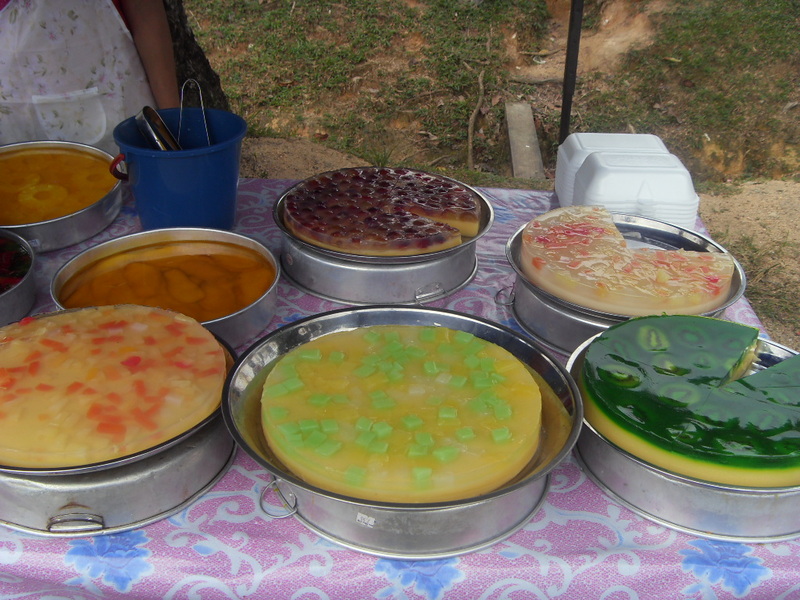 Fruit Flans Galore…Of course they had a Malay name I cannot remember because I was too captivated by what I saw. I thought it was really ingenuity. And finally this last photo I thought was the most photogenic of all. 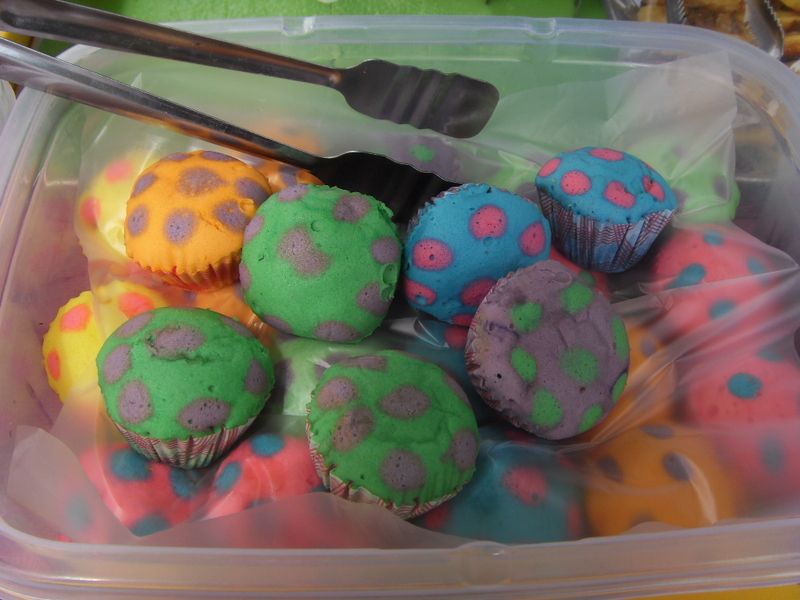 Found at Diva Kuih’s stall… such prettiness. 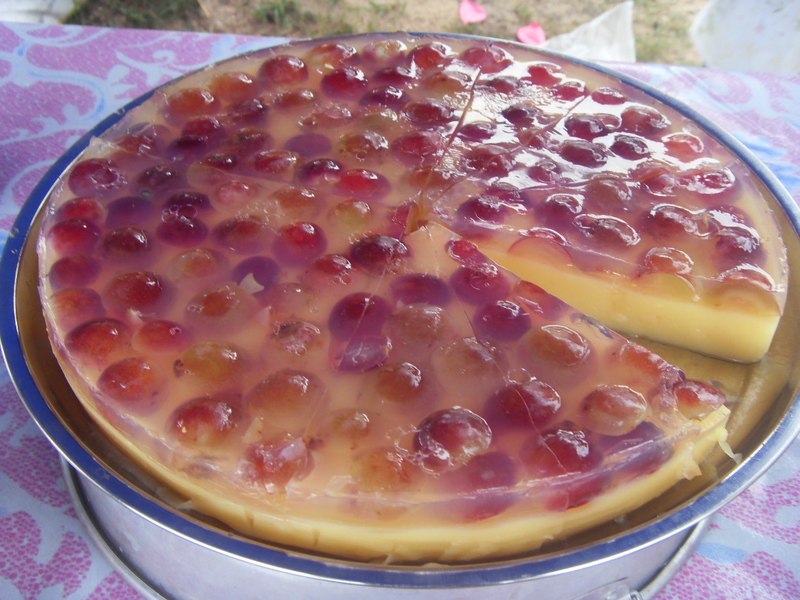 I have not tasted the above and the flans, but you must admit that this last photo is really photogenic and a happy ending. I am quite excited at doing this and there are still more stalls I have not ventured to because we had our hands full today. So let’s see what part 3 brings. 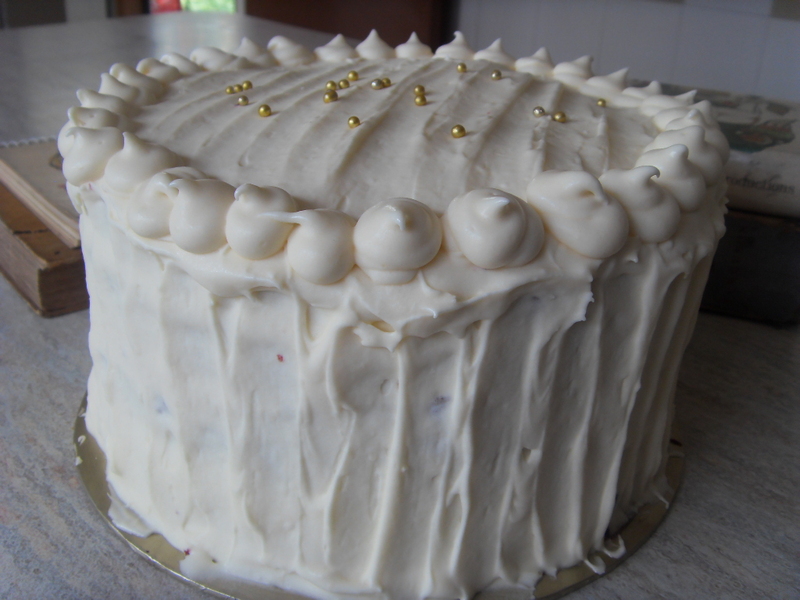 Bake a 3kg rustic red velvet cake and learn to make cheese icing and chocolate butter cream. Bring along container to take home 1/3 of cake. Small classes with highly experienced chef. 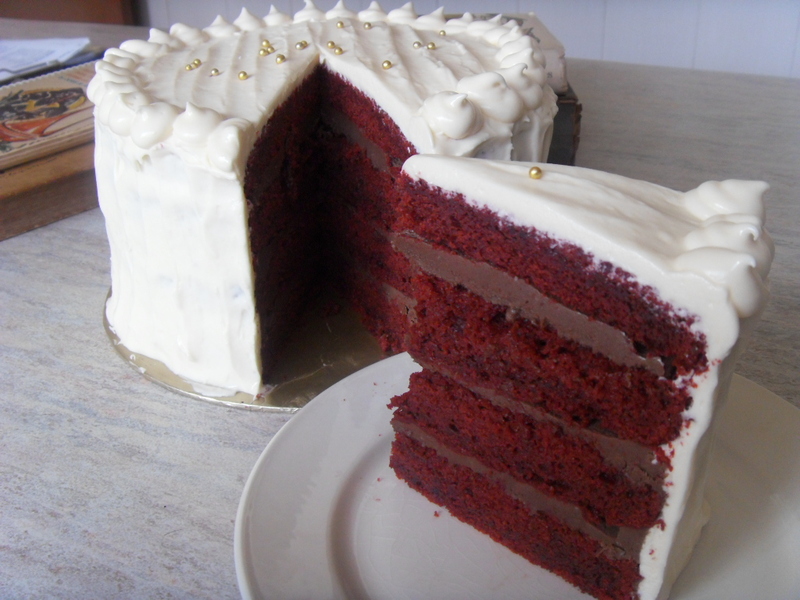 A Whole Red Velvet Cake - The Real Thing - no touch ups! Redemption period: Aug 14, 2011 – Sep 11, 2011. Bookings must be made between Aug 8, 2011 – Sep 9, 2011. Min. 2 days prior booking required. Bookings subject to availability. To sign up for a class, refer to class schedule and ‘how it works’ below write-up. Limit 1 per person. May buy many as gifts. For customers aged 15 and above only. Strictly min. 8, max. 9 per class. Students must bring a container sized at least 18cm x 15cm (H) x 30cm (L) to ensure cake is taken home in perfect condition. Valid at Cooking with Nicholas (016-682 7465). Ramadhan Buka Puasa Stalls – Section 14 PJ..
It’s this time of year the last ten years or so that Section 14 where I live comes very much alive. 70 stalls have now been neatly arranged around the playground by the side of my house, and so the next 25 days or so at around 3pm onwards, you will see smoke and wafting aromas of burning charcoal readied for grilled sting ray, grilled chicken, Satay, and a myriad other foods. 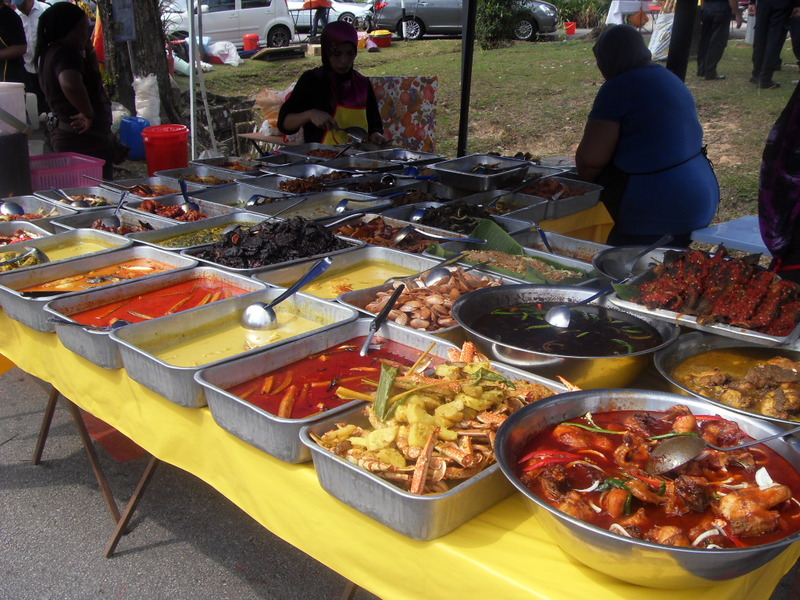 The clanging of woks, and the mixtures or aromas and people milling around waiting their turn is such a wonderful sight in this funny period in Malaysia where we all come together as one and enjoy Malay food of all different types. Here are some of the photos I took yesterday. Not the healthiest of meals but this is certainly different then the wet fillings we are used to. I did wonder about the redness of the sauce but at least it looks a lot like the poster at the bottom. Crispy Wet Spring Rolls is not really a new phenomenon, but the last few years a few kiosks have opened in Malls selling these snacks. 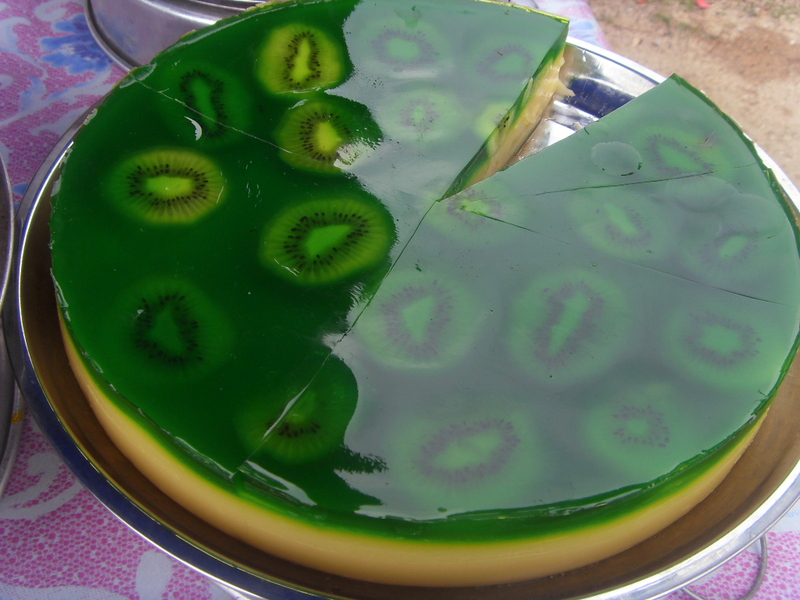 It’s perfect for afternoon tea. 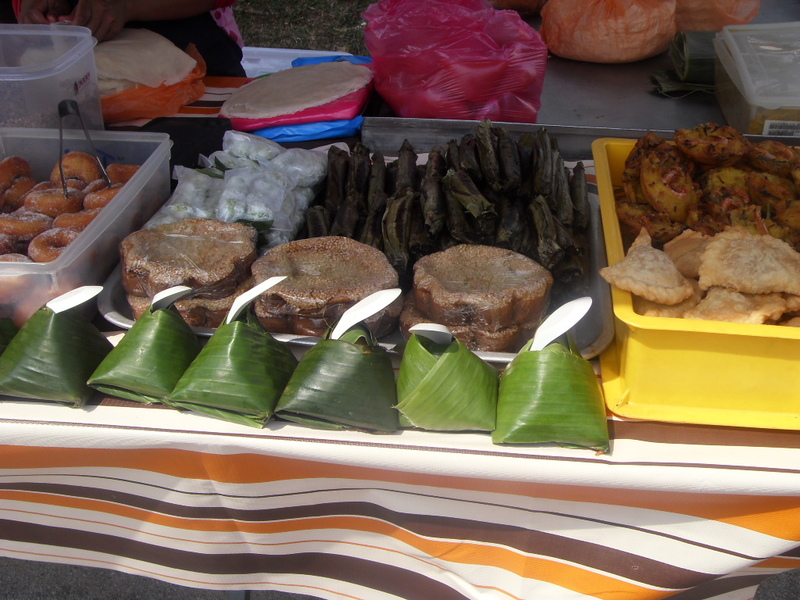 This was the only stall that sold Nasi Lemak wrapped in Banana Leaves, I did not try it but I am sure there is nothing better then unwrapping the rice parcel and tasting the rice and the taste of the banana leaf that was steamed with the heat of the rice. 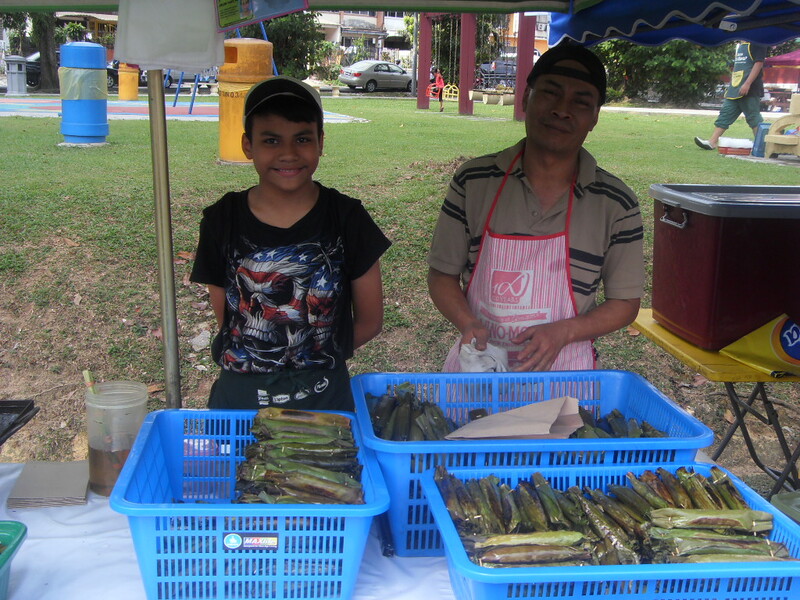 My most favorite stall, Pulut Panggang, now this father and son or sons and daughters are here every year and so far in the first three days we bought close to 15 of these wonderfully grilled glutinous rice with prawn and coconut filling. And I must add he didn’t stinge on the filling. At times you get a whole roll of grilled glutinous and nothing else, and perhaps a sliver of prawn and coconut. It’s so good, we’re packing some to take to Singapore next week. 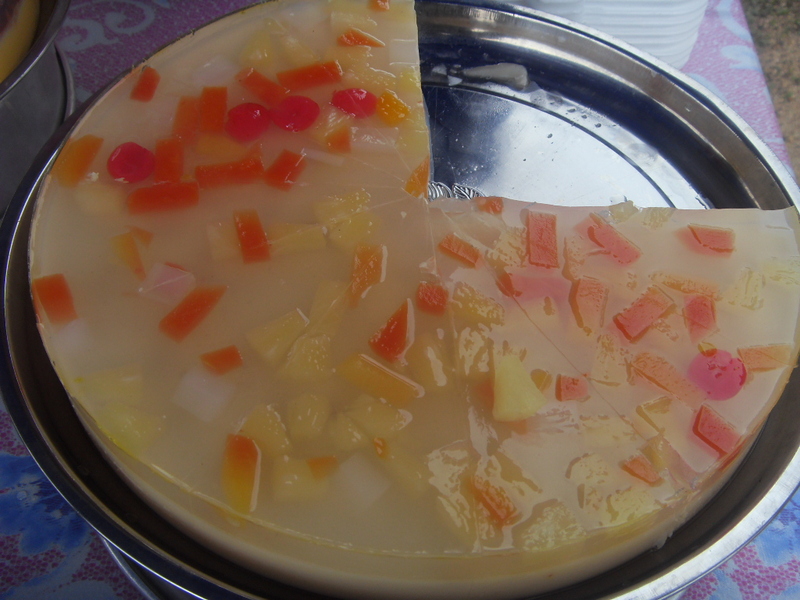 From the above, I am sure you can see how spoilt us Malaysians are when it comes to tea time. And shockingly these are foods we might eat at morning breaks as well. cheapest I think, and also the tastiest. Her Curry Puffs come in all sorts of shapes and sizes and flavors as well. I quite her Sardine Curry Puffs which she twisted to resemble a mini croissant. Her sweet potato curry puffs were nice too. Now once upon a time, only the poor ate sweet potato curry puffs because potatoes were too expensive, this has changed, now us normal folks have acquired the taste and enjoy it. 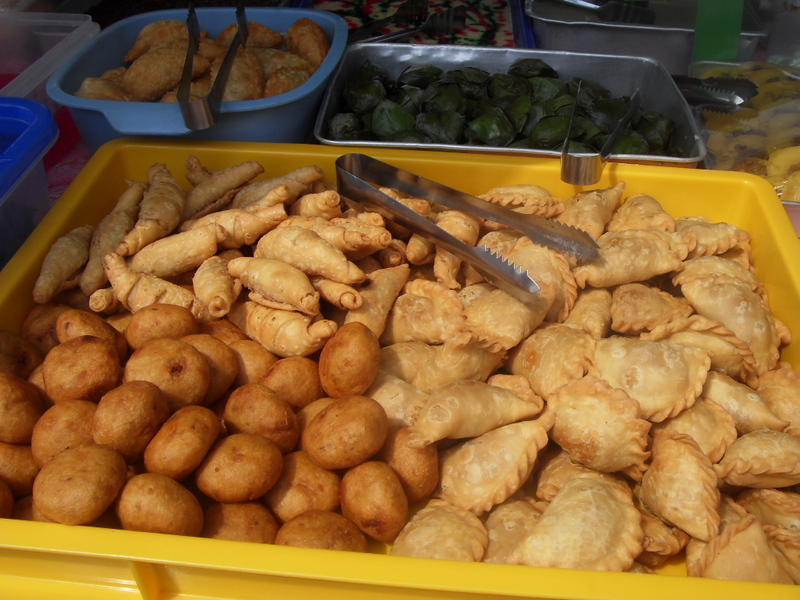 I also liked her cucur badak, sweet potato puffs so to speak with a dried prawn and coconut filling. I would have loved it piping hot but I cannot complain. 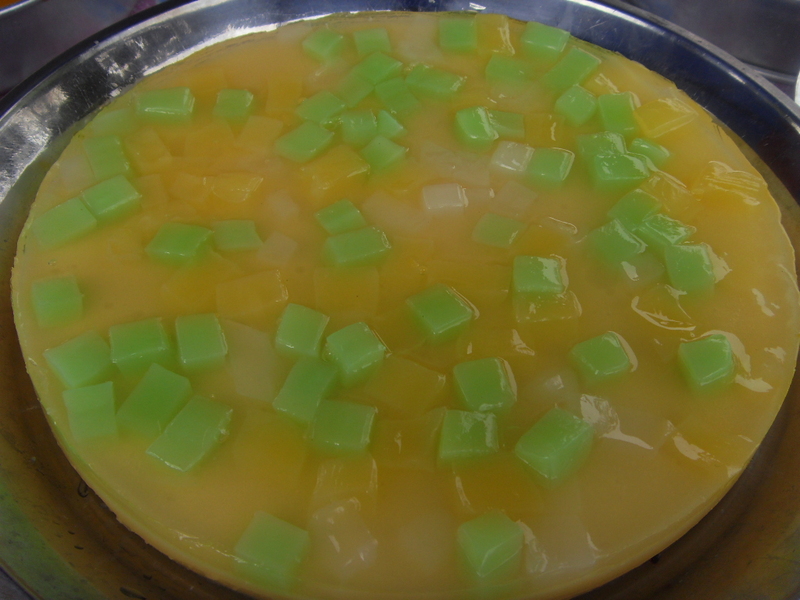 Kuih Cara Berlauk, is another delicacy she had, and she had two sizes. Now Kuih Cara is slightly similar to Yorkshire Pudding minus the dripping and this Malaysian version had its filling on top. You can get the sweet filling or the savory one. Diva Kuih had meat on hers. 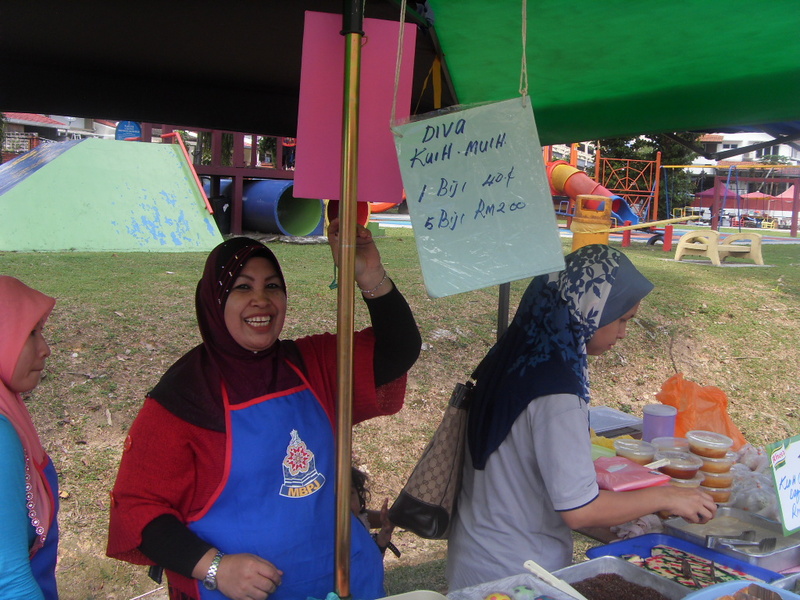 I’m not marketing Diva Kuih, but it’s just that her infectious smile made me go back and get stuff a few more times since Monday. 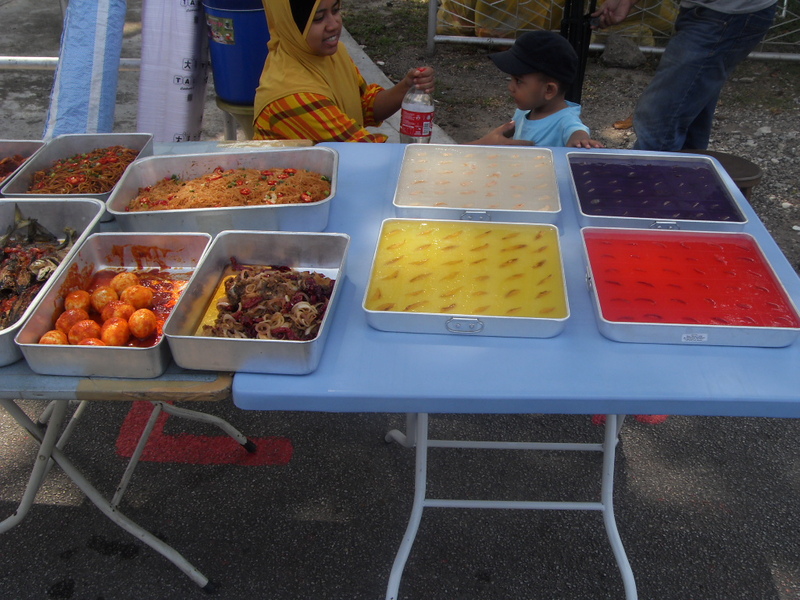 Do try her other delicacies like Kuih Kosui, and a myriad other cakes and kuihs before the 28th of August. 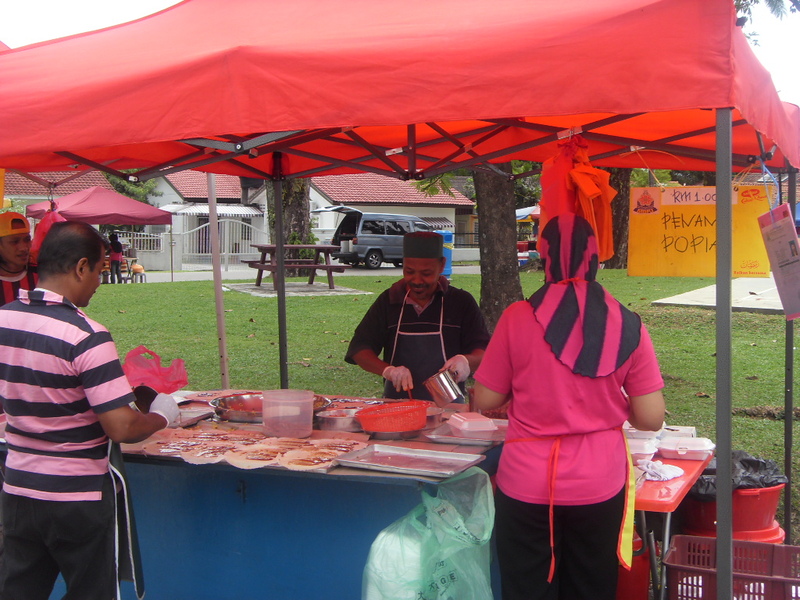 The next stall to catch my attention was the stall selling Malay Food. Now this stall is best explained through the photos I have taken because it would be too long, so have a look. 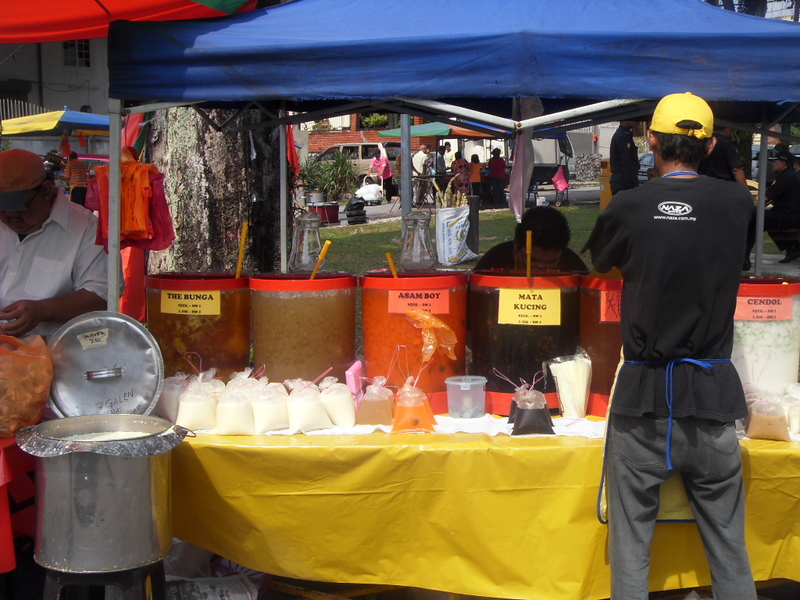 The Famous Drink Stalls, only in Malaysia would you find drinks of different and mysterious types sold anywhere and at anytime especially at the Buka Puasa Stalls. I have personally never tasted anything before, not even once but perhaps I should not judge and try it. 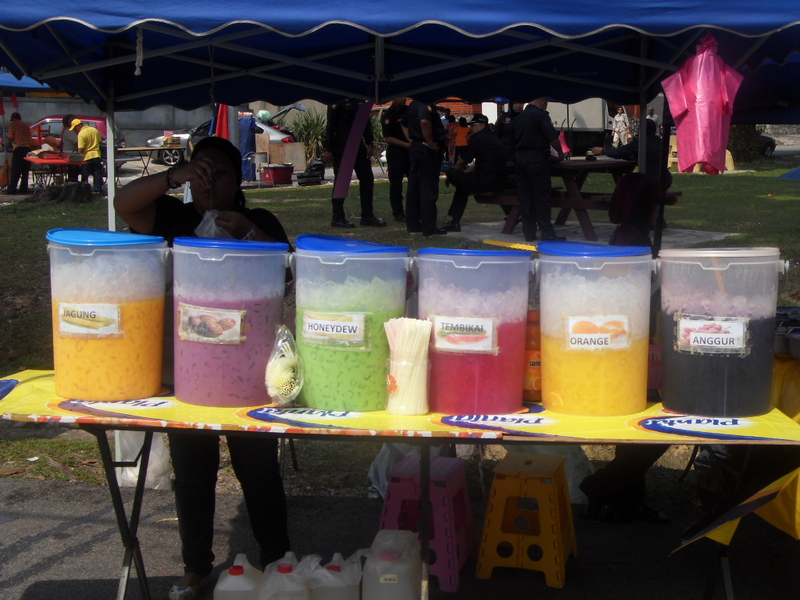 Now you will find these drink stalls dotted along at every stretch. Each selling almost the same thing but differing flavorwise. Now this next stall is actually an Icon of Section 14. The lady sells Nasi Lemak and if you want to know which one, just go to the section 14 stalls and you will see the longest line each morning. I have had their food since I was a wee wee lad. We’re talking single digits on one hand. I even got into trouble a few times by sneaking out when no one was around to buy her nasi lemak only to have mum go and buy nasi lemak for me later and the Lady would say I was there earlier, this usually meant a good smacking but trust me it was WORTH IT!!! My sister was usually involved as well though she often pretended. 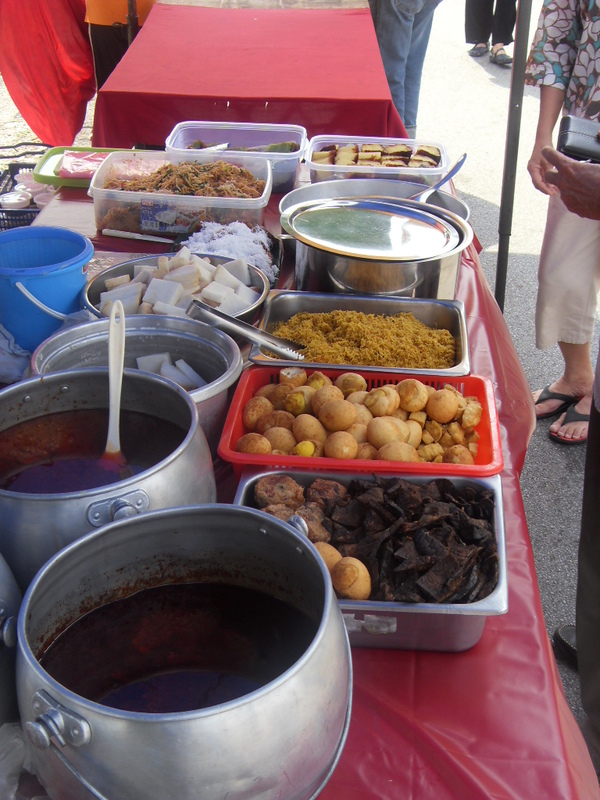 Now this year like all other years they are selling their famous lontong. Lontong is a Malay style few which is flavored with lemon grass, and galangal and of course onions and garlic, and then coconut cream is added. The yellowness comes from the use of turmeric. 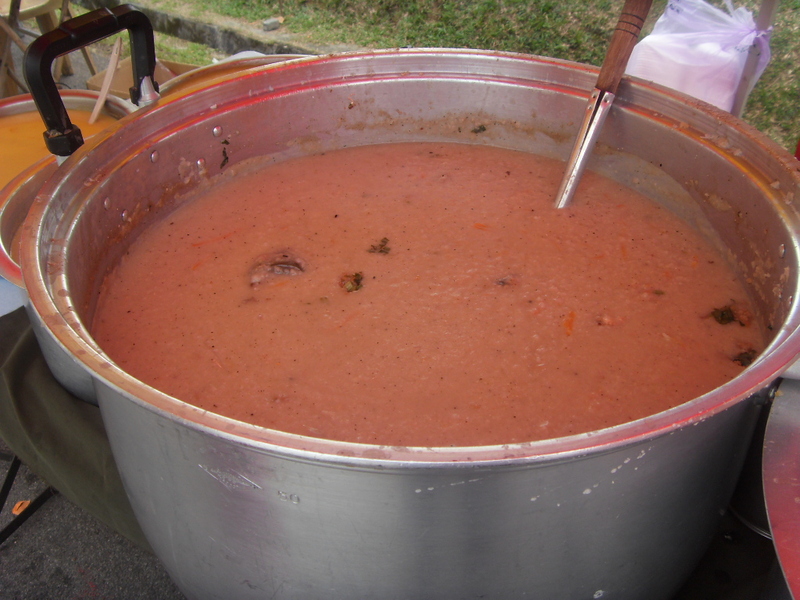 Now this soup has many accompaniments like rice cakes (Ketupat), fried lungs – as horrible as this sounds its really yummy. It also has eggs, vegetables, spicy coconut floss, and other things as well. Sometimes you even have it with fried Tempeh. Then it is laced with sambal to give and added kick. Now this last stall Stall number 70… I felt sorry for the lady because no one seemed to stop at her stall. 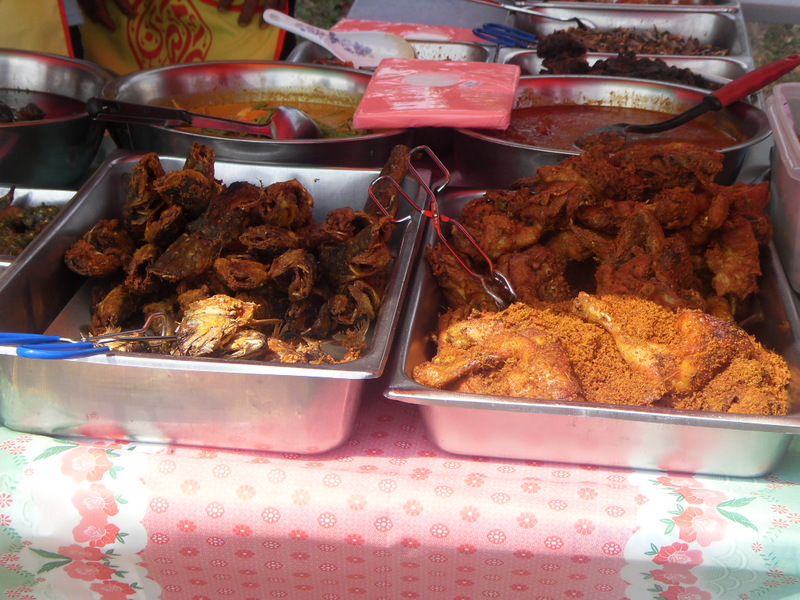 She sold homemade food and particularly I liked her Ikan Pekasam with Onions and Dried Chillies. Now Ikan Pekasam is usually fish caught at paddy fields and then pickled in tamarind and salt. The flavor is appetite whetting and as us Asians are well known for liking smelly foods, this one in particular is not a favorite amongst many but my family likes it. 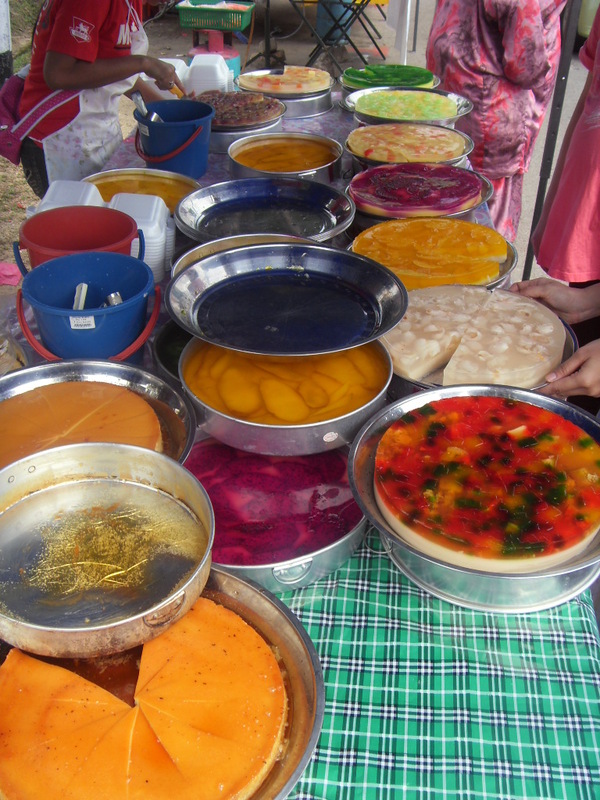 This is a delicacy for Perak. 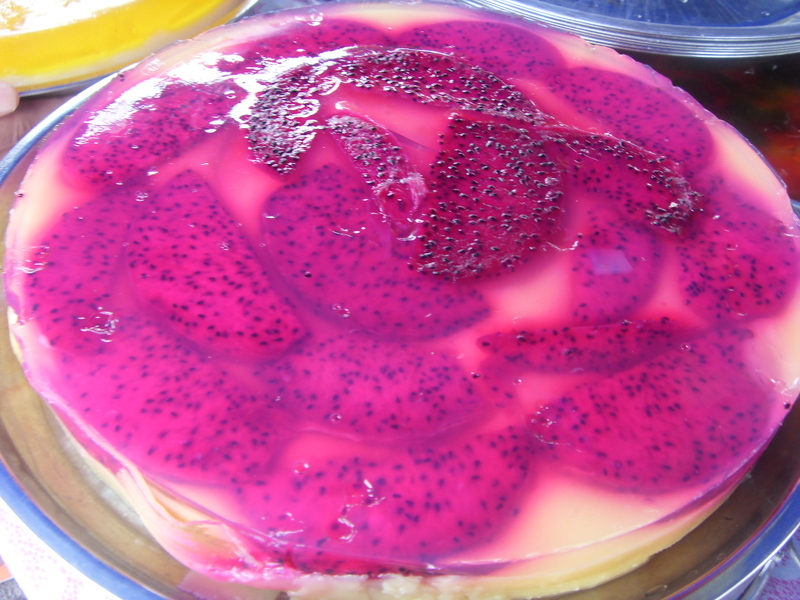 She makes quite interesting jellies and so I thought I’d buy some seeing that no one bought any, and I placed it in the fridge to get cold and when we ate it, Poor Possum forgot to add sugar to it 🙂 I had no heart to tell her. 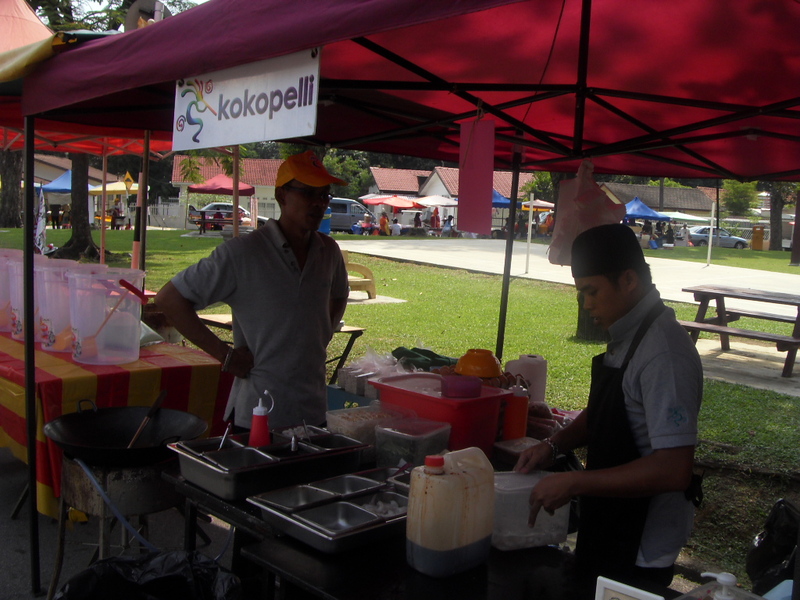 Now a few stalls that should not be missed is Kokopelli’s Char Koay Teow. Now this Malay man has mastered this dish and makes it as good as the Chinese. Kudos to him. 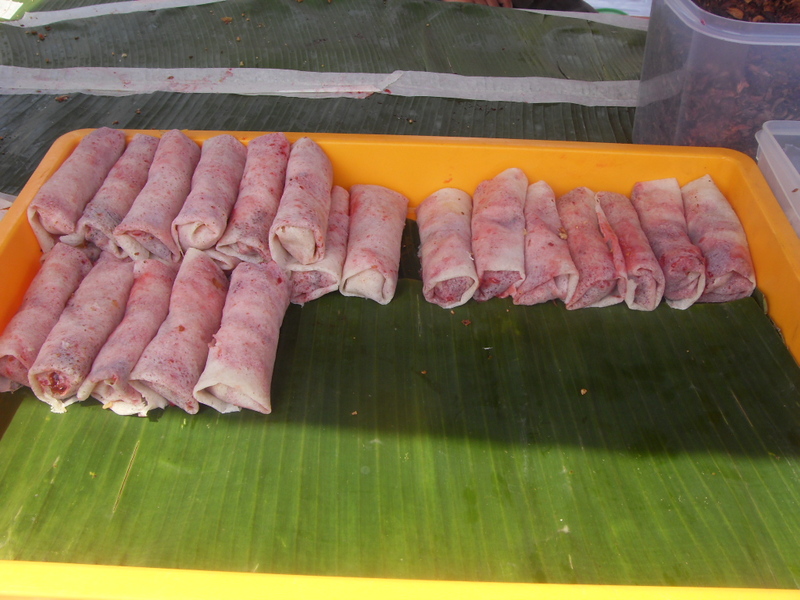 And of course don’t miss the Popiah stall because hardly anyone misses it because of its long long line. Now let it be known, this is Section 14 gossip. 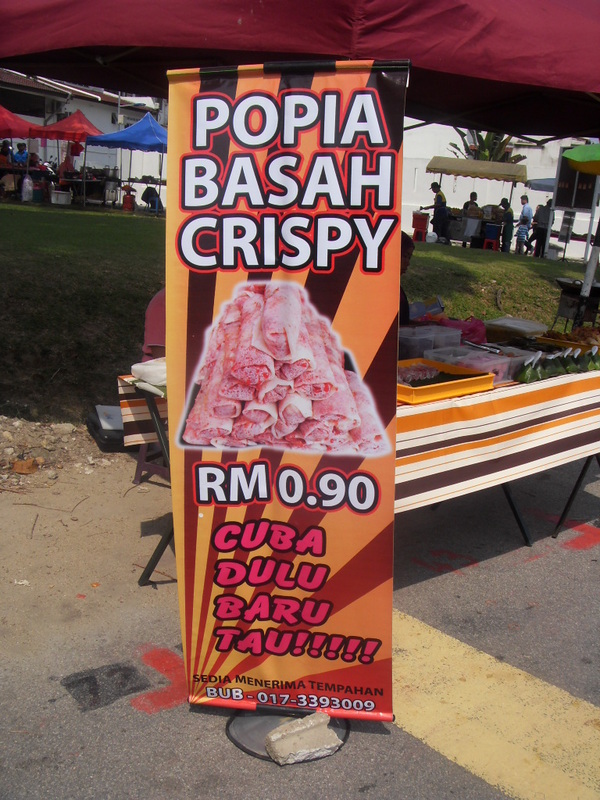 This is not the real Popiah Basah seller from the market. 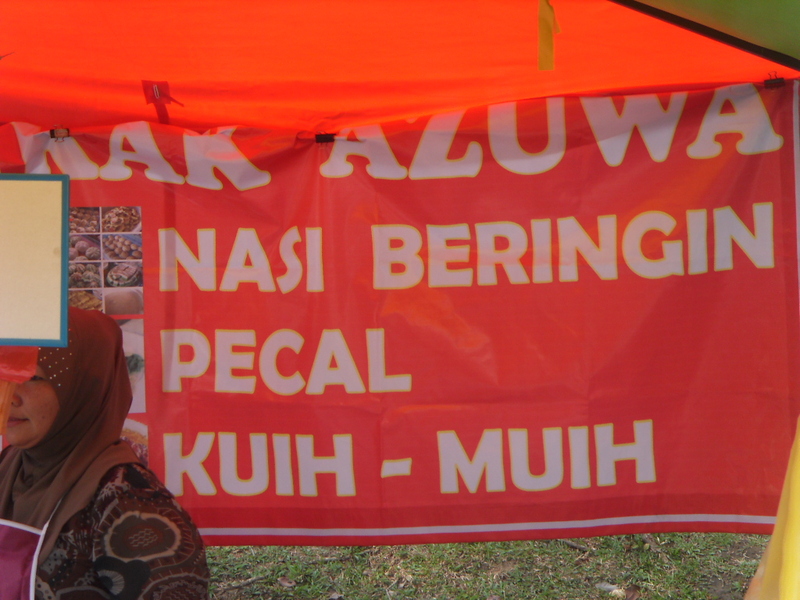 This one is an impostor who claims he has been selling it at the ramadhan stalls for 20 years… yeah good one… these stalls only started in 1998! It was a business deal that went wrong and the original fella backed off. He still operates in the market and watching everyone line up yesterday in the blazing sun, I thought was such a waste when you could be lining up in shaded comfort of the market complete with fan and all. Finally, I must say this year the council did the right thing by preventing an over supply of stalls and making the small stall holders lose out to the bigger ones. This comes but once a year so do go out spend, eat and enjoy! Selamat Berpuasa my Muslim Friends and Readers!!!!!! !